The minor leaguers #Marlins are getting are Jorge Guzman and Jose Devers, who is Rafael Devers' cousin. Source: #Yankees taking $265M of $295M owed Stanton. Sherman reports the Yankees will part with minor leaguers Jorge Guzman (acquired in the Brian McCann trade last Winter) and Jose Devers. Guzman is a RHP flamethrower who can touch as high as 105 miles per hour with his fastball and Devers is an 18 year old shortstop international free agent signing from the Dominican Republic (and cousin of Red Sox 3B Rafael Devers). Rosenthal confirms that Miami will be contributing $30 million in the deal (Heyman had previously reported $35 million). Per FanRag's Jon Heyman, the deal is now official. The Yankees will send 2B Starlin Castro and lower-level prospects to Miami for Stanton and $35 million. The $35 million reduces the Yankees' obligation on Stanton's remaining ten years to $260 million total, and an AAV cap hit of $22.3 million. NJ.com's Brendan Kuty is reporting that the Marlins are looking at "Class-A and younger" prospects from the Yankees' system. Reports are that they are names that are not highly recognizable. Few are more familiar with New York's farm system than Miami's current Director of Player Development and Scouting, Gary Denbo. Denbo was formerly with the Yankees in the role of Vice President of Player Development and farm director and is believed to have his hands all over this deal. Sherman updated his prior note that Castro would be the only Yankees veteran being sent to Miami in the deal. The rest of the trade will be comprised of New York prospects, though still none of their best. Heard Castro is only veteran going to #Marlins for Stanton. Rest of deal is prospecds, but not #Yankees best. Late last night, news broke that the Yankees were in hot pursuit of 2017 National League home run king and Most Valuable Player Giancarlo Stanton after the slugger nixed trades to both the St. Louis Cardinals and San Francisco Giants. Per Craig Mish, Stanton announced Thursday night that he would only approve trades to the Yankees, Dodgers, Cubs and Astros. 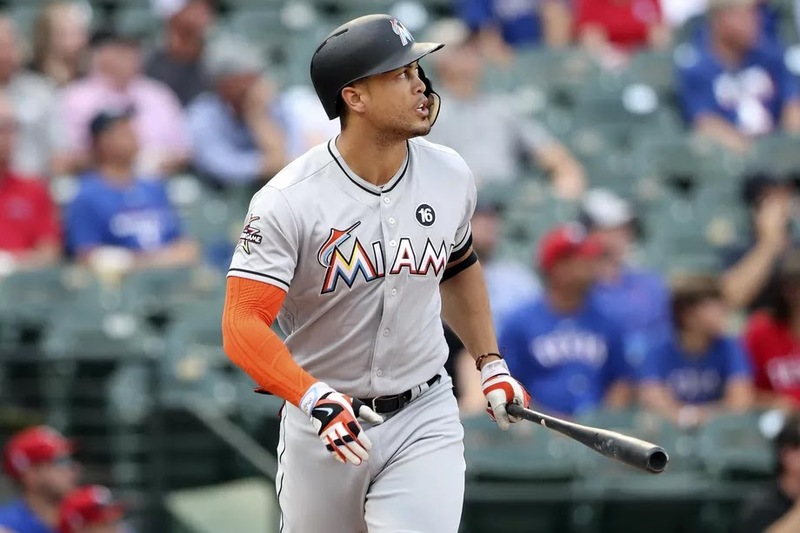 The Yankees were never fully in on Stanton this offseason, but once he was made available at a discounted rate, Brian Cashman couldn’t help but bite and pair him with American League Rookie of the Year home run champ Aaron Judge. Together, they create possibly the most fearsome duo since the “M&M Boys” - New York’s Roger Maris and Mickey Mantle - over 50 years ago. Miami's desire to get out from under Stanton's contract - paired with the slugger's full no-trade clause - left the Marlins with little to no leverage in talks, and ultimately led to Stanton being made available at a significantly lower cost. Per Joel Sherman of the New York Post, the Yankees will trade at least Starlin Castro in the deal as well as prospects, but not of the upper echelon of the system the likes of Gleyber Torres, Justus Sheffield or Estevan Florial. Miami has stood firm that they do not want the albatross contract of Jacoby Ellsbury in this deal, but it's possible New York is able to include Chase Headley in the deal as well. Trading Castro's seven-year, $60 million contract clears $8.57 million in AAV and the Yankees are hopefully able to shed additional salary as they will be taking on $25 million in AAV from Stanton's 13-year, $325 million contract. Hal Steinbrenner and Brian Cashman have both stated on multiple occassions that the Yankees hope to clear the $197 million luxury tax threshold for the 2018 season. More to come on this breaking story as news is made available.